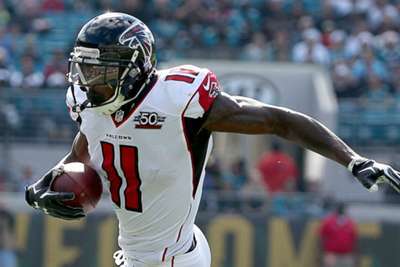 Julio Jones finally scored his first touchdown of the season in the Atlanta Falcons' victory over the Washington Redskins on Sunday. The Falcons receiver snagged a 35-yard pass from quarterback Matt Ryan to push Atlanta 37-14 up in the fourth quarter. Jones' first touchdown of the campaign came on his 60th catch, 343 days after he last saw the end zone in Week 12 of last season. He entered Week 9 with 53 catches for 812 yards this season.